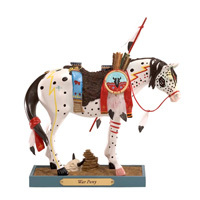 War Pony | Retired Ponies Figurines | One Price Low Flat Shipping! From the Trail of Painted Ponies Retired Collection, War Pony. Designed by artist, Rance Hood. Made of hand-painted resin. Stands 6" tall. Comanche artist Rance Hood is one of the most recognized names in Southwest Art. His paintings, known for their drama and authenticity, hang in museums and corporate collections. The opportunity to recreate a traditional war pony, complete with a buffalo pelt saddle, lance-and-shield, arrows and feathers, became the pinnalce piece of his distinguished career. This startingly realistic recreation of a Comanche war pony reflects the vibrancy and mystical quality of the horses that populate this popular artist's paintings.